We might have just found a Toyota Corolla that breaks the shackles of ubiquity. Saying the Corolla — Australia’s top-selling car this year, just like it was in 2014 — is common is like saying Jennifer Lawrence is lovely, or that the sky appears blue. It’s stating the obvious. But it’s not every day you see a green one with a manual gearbox, is it? In case you missed it, Toyota rather quietly launched the 2016 Corolla hatch range last month, introducing a range of improvements underneath, inside and — to these eyes — outside. 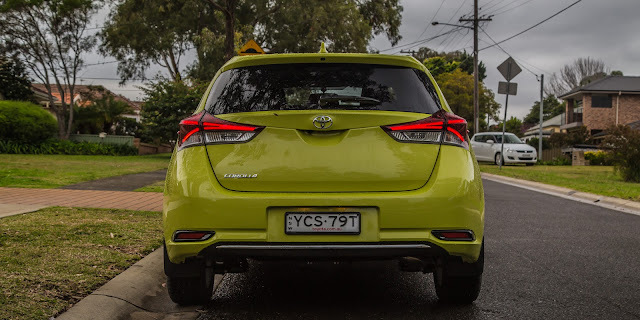 You might have seen our review of the flagship 2016 Corolla ZR a few weeks ago. Here’s take two. You might wonder why this review began by discussing colours and celebrities. Well, what exactly do you say about the Corolla that hasn’t been said? Isn’t it just honest, reliable and affordable transport that pleases many, but inspires few? No, actually. Toyota has rather stealthily lobbed a generally quite well-rounded small car at the market — not, we suspect, that it even really had to. And that makes it all the more commendable. As you might have read, Toyota took a two-pronged approach with the MY16 Corolla range, with the ‘sporty’ versions taking their revised styling from US-market Scions and the up-spec ones taking a leaf from the European Auris’ book. The car you’re looking at is the 2016 Toyota Corolla Ascent Sport, finished in Citrus yellow. It sits one rung above the base, fleet-favoured Ascent (now $19,790 plus on-road costs) in the range and as such targets the lucrative private buyer instead. It costs $20,790 plus on-road costs, which is $300 more than before. Read our 2016 Toyota Corolla hatch pricing and specifications story. Not only is the Ascent Sport targeted at buyers spending their own money, it is aimed at younger customers (either by years, or at heart) – perhaps like yourself. Styling tweaks over the old variant include a re-jigged front bumper, a wider lower grille, a more prominent Toyota logo and new headlight clusters. There’s also a new shark fin antenna. Truth be told, it’s quite a likeable-looking little car, with a wedged profile and an aggressive nose. That colour scheme is dubious, though the friendly servo operator we talked to suggested the new nose and colour scheme bared resemblance to a Renault Megane. 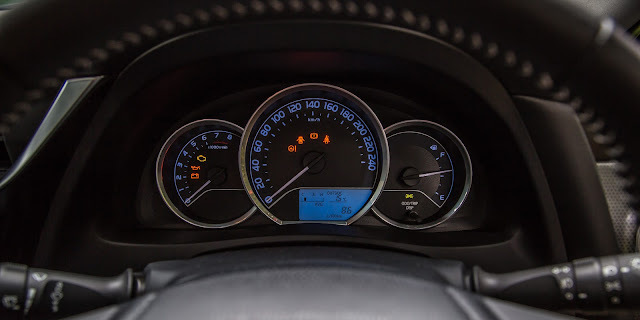 For the extra $1000 over the fleet special Ascent, you get a commendable amount of extra kit, including a new 7.0-inch touchscreen layout with voice recognition and Toyota Link, an app-based connectivity system which we’ll get to in a minute. You also get 16-inch alloy wheels, fog lights at the front, a ‘premium’ steering wheel — sorry, but fake stitches aren’t really premium, Toyota — and privacy glass. Existing standard fare includes USB/AUX inputs, Bluetooth phone and audio streaming, a reverse-view camera and cruise control. 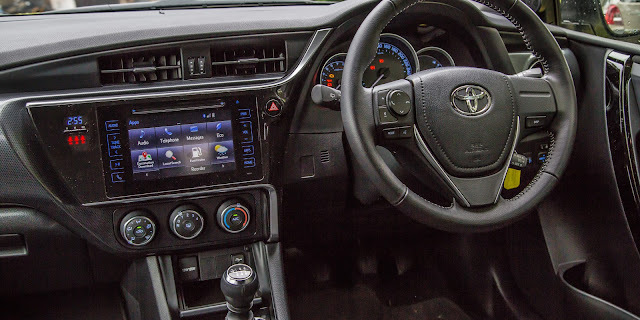 If you want a satellite-navigation system you have to step up to the $23,490 Corolla SX variant, which also adds SUNA live traffic updates, a sportier bodykit, 17-inch wheels, a full-colour instrument display ahead of the driver, sporty seats and paddle shifters for the optional CVT. It might just be the sweet spot, but nevertheless the Ascent Sport is well-equipped for what you pay. Overall, the Ascent Sport’s cabin is pretty well rounded, with the highlight being the slicker new touchscreen flanked by piano black plastics and backlit with cool blue. It’s vastly superior and less aftermarket in execution than before — the touch-sensitivity is pretty excellent — though we’d still prefer the Mazda 3’s MZD Connect system with its intuitive rotary dial controller. The app-based Toyota Link system lets you receive realtime advice on where to find fuel, easy-to-follow directions and the latest weather information. You can also search for local accommodation, restaurants and businesses in your area. It’s worth noting that, this week, Volkswagen made a new 6.5-inch screen with App-Connect USB interface for Apple CarPlay, Android Auto and MirrorLink standard on all variants, even the base car. The ergonomics are pretty spot-on, with plenty of seat and steering wheel adjustment to get comfortable. Everything is within easy reach, and the plethora of steering wheel buttons and the decent voice control system mean you can keep your hands where they belong more often. Toyota is typically thoughtful with the amount of cabin storage on offer, with two good cupholders, a decent centre console of sizeable door pockets available both front and rear. The black fabric seats up front are acceptable, though you’ll want to get our and have a decent stretch after a few hours at the wheel. The fitment of a reverse-view camera on all variants is commendable, though you still have large blind-spots to contend with as a result of the fat C-pillars (the metal bit between the rear-side window and the tailgate). 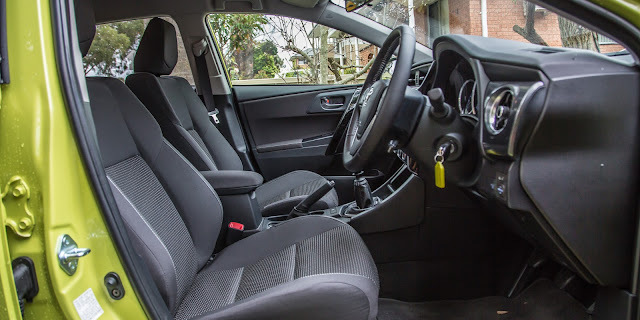 The rear seats remain middle-of-the-road in the class for legroom and headroom, meaning there’s space for two adults or three children (there are two ISOFIX anchors) in relative comfort. The rear row split- folds 60:40 to liberate extra storage space, which is a good thing because the 280 litres of cargo space available with the rear seats on use is sub-par. By comparison, the Mazda 3 offers 308L, the Hyundai i30 offers 378L, and the Volkswagen Golf has 380L. In the Corolla’s defence, that shallow loading area can at least be explained away by the welcome presence of a full-sized spare wheel rather than a space-saver or patch kit. Under the skin, Toyota has also given the MY16 a few suspension tweaks, with improvements made to the initial roll damping and straight-line comfort. In short, the MacPherson front struts get revised front shock absorbers, stabiliser bushes and coils in a bid to improve ride comfort and handling stability. According to Toyota, the coil shape has been changed with lateral force-reducing springs, while the twist resistance of the strut bearing has been reduced, theoretically contributing to steering feel. A fluoropolymer coating has been applied to the inner surface of the stabiliser bush, aiding ride comfort because it facilitates a smoother stroke. Damping force characteristics of the torsion-beam rear suspension have also been retuned for more comfort and stability. What does all this translate to? The damping is excellent most notably at low speeds and over rugged inner-city roads, conveniently just the sort of activity most Corollas will do, most of the time. Bump absorption is first class, while rebound is controlled enough to stop the car from feeling floaty on the straight-ahead — this means you feel more stable and planted at higher speeds. This feeling of solidity and comfort reinforces good levels of firewall sound deadening, and acceptable insulation from wind and tyre noise. In terms of overall dynamism, the Corolla remains a bit of a surprise packet. The electric-assist power steering mapping has been tuned to dial-in more resistance at higher speeds, while it’s still light yet rarely numb around town. Throw the Corolla at some corners and you’ll find it keen enough to tuck its nose in (that’s what the initial roll damping tweaks have yielded), and general levels of agility are more than most drivers would demand. Mid-corner, you’ll find that basic torsion-beam rear end occasionally decreasing your contact patch, meaning mid-corner bumps and ruts will throw you off line more than, say, a Ford Focus will. Toyota’s stability control system is also fierce and rapid to intrude, but for this kind of car it’s fine — less so on something like the 86 coupe. One area of the car that hasn’t changed is the engine, which sports a basic design, but then again is one source for the Corolla’s famous reliability. 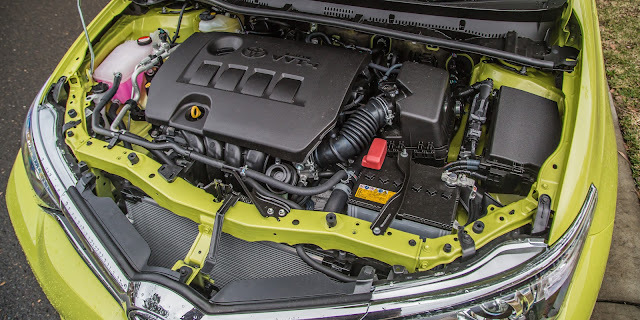 The 1.8-litre naturally-aspirated petrol engine makes 103kW of power at 6400rpm and 173Nm at 4000rpm, meaning you get more out of it at higher revs than you would with, say, the Golf’s 1.4-litre turbo that hits peak torque (200Nm) at 1400rpm. It’s still worth mentioning that a base Mazda 3 has a 114kW/200Nm 2.0-litre engine. Nevertheless, refinement levels are such that it never feels buzzy, and performance, while never rapid, is linear off the line and acceptably brisk for daily duties, down in no small part to the Corolla’s light-for-the-class 1290-kilogram kerb weight. Does it earn the sport badge? No. Does it do the job most require? Yep. 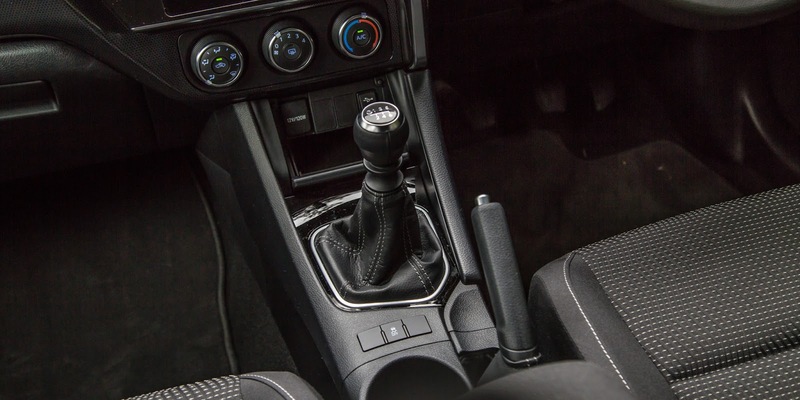 The six-speed manual gearbox — most people will fork out the extra $2000 for the CVT auto — is a little vague and has a long-ish throw, while the clutch is both light and contains a friction or bite point that takes a minute to adjust to. The addition across the range of Hill Start Assist, to stop rollbacks, is welcome. Toyota claims combined cycle fuel consumption of 6.7 litres per 100 kilometres. We averaged around 7.8L/100km on our drive. Another side-effect of the older engine is its willingness to run on cheaper 91RON petrol. In terms of running costs, Toyota covers the Corolla with its $140 capped-price servicing plan covering six scheduled logbook services in the first three years or 60,000km (the intervals are short, at six-months/10,000km). You also get a three-year/100,000km warranty — less than half that of the Kia Cerato (seven years/unlimited km). So there you have it, the 2016 Toyota Corolla Ascent Sport, the cheapest variant aimed at private, or real, buyers, as opposed to the fleet-focused Ascent. At $20,790, it’s good value for money, and it will no doubt be cheap to operate, and reliable through the years. What’s good about this MY16 model, though, are the notable improvements inside the cabin, and the lovely urban ride that makes this a downright liveable — if not altogether loveable — proposition. Just don’t take that ‘Sport’ badge too literally.